Born in 1965 in Burgundy. She lives near Paris with her family (mother of 3 children). 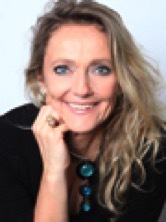 Véronique is a Body Therapist, certified " Sexual Grounding Therapy". She has been teaching the “Love and Ecstasy Training” in France and has been a Rebirther for the last 15 years. She continues to work on vegetotherapy (the original therapeutic approach developed by Wilhelm Reich). For over 15 years she has conducted seminars and supported people individually. As a therapist, Véronique is teaching her own programs such as couple mediation, young adults group, women’s group. Inspired by her travels in India, through her life as a wife and mother she likes to share her passion for SGT in France and has put on the program in her country of origin.